Now nominated for the Nebula Award for Best Novel of 2011." 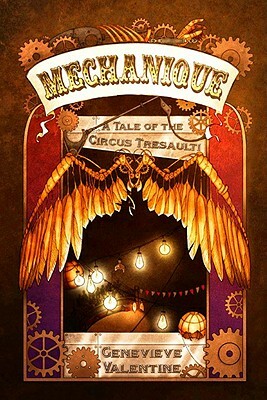 Outside any city still standing, the Mechanical Circus Tresaulti sets up its tents. Crowds pack the benches to gawk at the brass-and-copper troupe and their impossible feats: Ayar the Strong Man, the acrobatic Grimaldi Brothers, fearless Elena and her aerialists who perform on living trapezes. War is everywhere, but while the Circus is performing, the world is magic. That magic is no accident: Boss builds her circus from the bones out, molding a mechanical company that will survive the unforgiving landscape.